I do not like books that claim to be funny. I get scared of them mostly, because I haven’t laughed out loud in a while, while reading a book. So when the author sent me a copy of, “Aisle Be Damned” I was sceptical. I didn’t know if I would enjoy it or not. In fact, it even stayed on my shelf for a while before I picked it up randomly on a Saturday afternoon and finished it in less than two hours and might I add – that I laughed in most parts. Yes, I laughed out loud. “Aisle Be Damned” is all about air travel. Let me retract a bit. It is about and for people who do not like to travel by air and yet have to. It is about experiences that every single flyer can relate to. It is about incidents that could happen on any flight to you and me and it is also a testimony to everything that goes wrong (barely right) as you are thousand feet up in the sky, and cannot do anything about the situation. 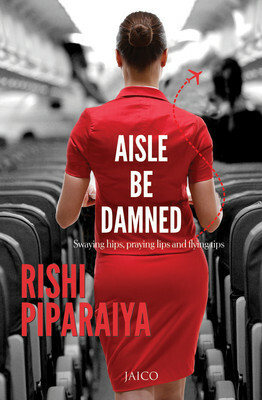 Rishi Piparaiya makes the book immensely personal and that is what is most enjoyable about it. The anecdotes will leave you in splits. From how to win the affections of flight attendants to how to get ahead in your career to how to woo men or women during a long flight or better yet, how to make use of a water bottle for safety. I hate being on a flight and there is a chapter for people like me as well. Thank Goodness! I did not like the additional chapter in the book. I think that was unnecessary and I almost breezed through it. Having said that, I loved the rest of the book. There is a lot of potential for a sequel and I hope Rishi writes another one. I for sure will read it and yes, in all probability laugh out loud the second time around as well. This entry was posted in Books, Jaico Books, Non Fiction, Review and tagged Air Travel, Aisle Be Damned, Humor, Jaico Books, Rishi Piparaiya on October 25, 2013 by thehungryreader.